Introducing the new NetPhone bundle for only $11 per month. 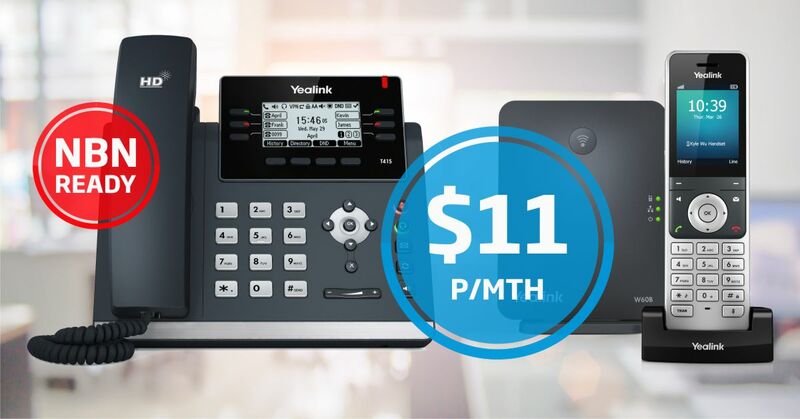 It comes complete with a business IP phone, a hosted PBX licence with all the enterprise grade features, and a business VoIP line including a dedicated phone number. You can also port-in your existing landline number if necessary. The NetPhone bundle comes complete with a choice of either a business grade desk phone or a cordless phone. Choose the one that suits your business requirements. It also comes with an Australian landline number with an area code of your choice. Business NetPhones are a combination of hosted PBX and business VoIP, which together offer the best possible call rates and no line rental. Reduce your telco costs by replacing your traditional telephone line with a NetPhone. Business NetPhones are ideal for businesses looking for an out-of-the-box solution for their office phone requirements. And you don't need a telephone line to make it work. Just plug the NetPhone into an adequate broadband service and you're up and running. It's as simple as that.